Two brown suits for travel or business. On the left, a five-button peak lapel model with long fitted body and lower slanting piped pockets. Shirt with inverted pleats front and back. 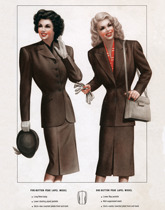 On the right, a one-button peak lapel model with lower flap pockets, well-suppressed waist and skirt with inverted pleats front and back.